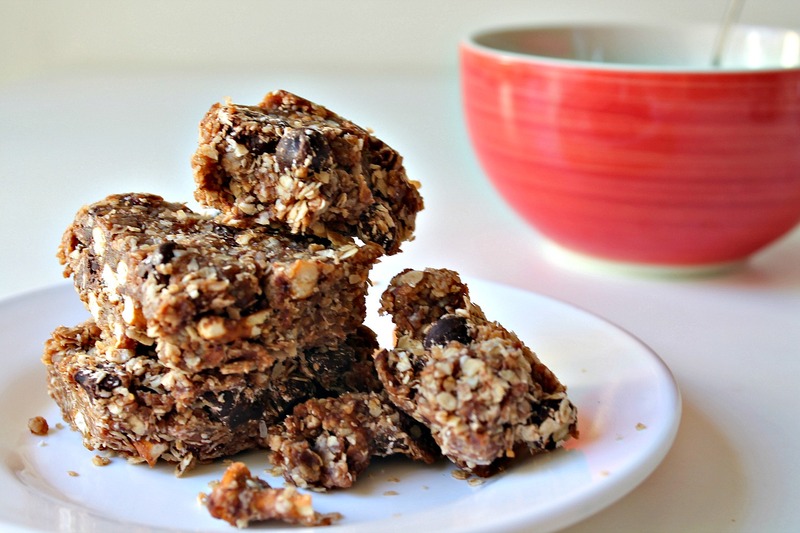 I dare you to tell me this is “just another healthy oat bar” recipe. I triple dog dare you, and if you lose, I will bite the head off a hapless gingerbread man (is it almost that time of the year already? Sigh). Apart from the mumbled ooh’s and aah’s these bars received when I brought them to my friends’ houses, this healthy snack alternative just knocked my socks off. I was messing around with the food processor last week because it’s been a solid 98 degrees all week here. Living in perpetual beautiful summertime may not sound like a problem, but it is indeed a problem. A big, fat Californian first-world problem. Try hashtagging that. I expected “good,” I expected “delicious”–but I did not expect these. I anticipated “love ’em!”, I anticipated “yum!”–but I did not anticipate this. And really, who am I to disobey? is also like a merit or something. I’m thinking granola bowl, served with vanilla soy milk or–better yet–sweetened coconut milk. Or crumbled and sprinkled over a cup of Greek yogurt, because they’re pretty crumbly already to begin with. What do you think? Do the world a favor. Bookmark these, save ’em for that godforsaken day when you’re staring at your online calendar and realize with a pang of horror that you haven’t made anything for that oh-so-fancy-shmancy 10-year high school reunion/potluck yet. Save this for that day when the gallon tub of ice cream sitting in your freezer is screaming your name and you still have two weeks to fit into your bridesmaid dress. Trust me on this one: you can thank me later. I’m sharing this recipe with all the #SundaySupper crew today as part of our “Unprocessed” series, which means you get a sneak peek at oodles of other awesome unprocessed recipes from our talented bloggers. Lucky you! In food processor, grind dates and nuts until they form a cchunky paste. Afd nut butter, coconut oil, vanilla, soy milk, and salt. Continue processing until a smoother but thick paste fos, about 3 minutes. 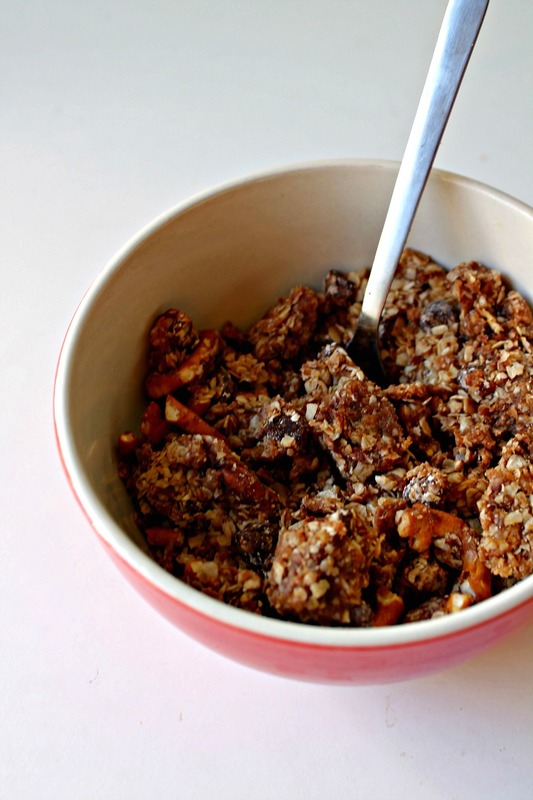 In a large bowl, combine oats, pretzels, and chocolate chips. Pour paste into oat mixture and knead the paste through as best as you can. Mixture will be very thick! When oats are coated, press into a 9x5-inch loaf pan lined with foil. Refrigerate for at least 4 hours before cutting into squares and enjoying! Oh my. I want to reach in and grab one of those right now. Yum! I hear you, Renee–I’m the same way, the only problem is that they’re sitting right here at my fingertips! (No joke.) Double yum! I love when dishes surprise me like these did for you. They look amazing! ARE YOU MOVING TO CALI? haha that’d be so awesome–I really do dig the sunshine here, despite what I might say to the contrary. ahhh how exciting! when where how? Hmmm… do you think this would work with sunflower seeds instead of nuts? My workplace is completely nut-free, but these sound amazing and I’d like to make them to bring for breakfasts. Or, you know, to eat the whole thing in one sitting and then feel sickly full all day. If they don’t, I can always just eat them at home, because almonds! but I’d love to be able to bring them with me. Beth–you know it! Though I’ve never tried it myself, I bet seeds would be an awesome sub–do tell me how that goes for you, because your workplace is going to love them. You might want to throw in an extra tablespoonful of sunflower seed butter or other non-nut butter to keep the dough holding together; it’s rather crumbly, and I suspect the oil from the nuts help bind, so that might help. And ugh, I totally endorse eating the whole pan–to be (grossly) honest, I didn’t even feel that terrible after eating the whole pan. Woe unto me, seriously. These are so. Good. Make a pan for work and make a pan for you! Cheers! Will let you know how they turn out. They are in my fridge right now getting more solid! Made with sunflower seeds, and then I added an extra heaping tablespoon of sunbutter to the batch. Ohh, those sound like great subs! Yes, let me know so I can share your changes with other folks! Whoo! I’ve fought that battle before, believe you me. Glad you love ’em! Yeah, I could totally snack on these like crazy! Yay Brianne, I totally hear you! Awesome to have you stopping by here, girl! Have a looovely day. ok, clearly i am having issues here – i came back to get the recipe and write down the ingredients for my grocery list, and i can’t find the recipe!!! I hear you, Liz–I’m moseying to the kitchen now to grab some more (for better or for…betterer 😉 ) Have an awesome week, lady! Hi there! Love your photos, they are wonderful! 🙂 And bars look super-tasty! Mila–*thank you! * So glad you like them and that you’ve found my blog 😉 I just nipped over to yours–ohmigosh! So much awesome stuff happening over there, must comment soon! Cheerios! I can’t wait to make these!! I have everything I need too! Ohh, good on you, Sarah! I cannot WAIT to hear how you love them! <3 Go go go, girl! 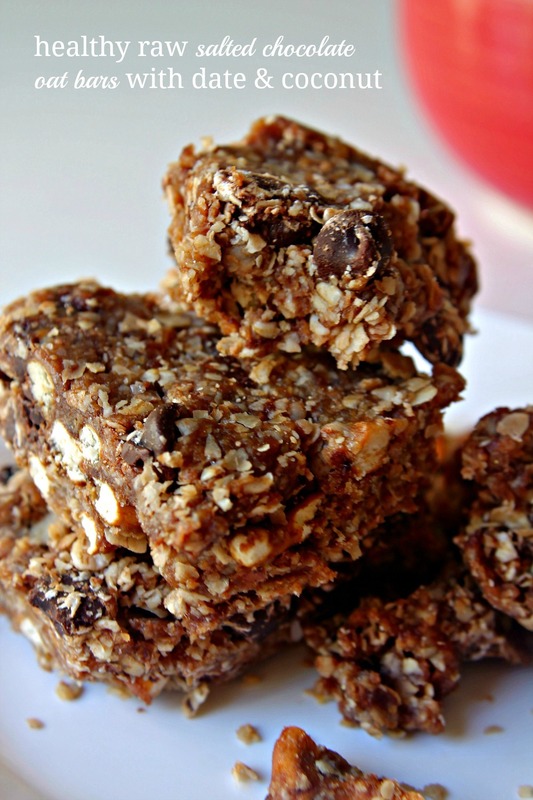 These bars do look super healthy but also VERY delicious! How do you do it? Ummmmm. Yeah OKAY MEBE I WILL. haha! Or I’ll be your fellow dessert ogler/sharer at least 😀 same to you, Uru? We need to do more recipe exchanges, at the very least. Speaking of which, I’m off to read your blog. You ROCK! These bars must have been so well balanced, not only in flavor but in texture too. They look delicious. Thanks, DB! They absolutely hit the spot in every area! Please send some of those my way! They sounds delicious! *Very* healthy 😉 not something I’d mind munching away on all day (as I’ve already proven)…thanks, John! Wow. these look amazing! Guilt-free snacking on something that scrumptious? Yes please! Um YES! Totally agreed, Katy. Thanks so much for stopping by!–have yourself a lovely week! You have all my favorite goodies in here! I knew it–we are soulmates! Ala you must have been reading my mind because I have been looking for a snack like this that satisfies my sweet/salty/crunchy cravings. I bought Fiber One bars but……they leave much to be desired PLUS are processed. Perfect recipe!! I do major in mind-melding, you know 😉 Fiber One’s got nothing on these (I know because I sloughed through approximately a month’s worth of them before I finally made these instead). Hope you love ’em! As my friend TSwift might say: never, ever, ever, ever! I agree wholeheartedly and am off to ogle at your blog now 🙂 how did you find me? I’m glad you did! These are fantastic Ala!! I am totally making these for the fam. Pinned! Excellent–thanks so much, Trish! The fam would love love love them…and I hope they do! Can you puh-lease mail me some to Florida?! Kthx 🙂 But seriously, I can’t wait to make these! Not only do we live in very “warm” (okay, hot) Santa Monica, CA, I see we share the same tastes for scrumptious sweets…But we can indulge because they are the healthy kind, right?! Okay yeah, let’s dessert bar it up sometime! Seriously, I need some ice cream to go with these bars, amiright? Oh, these bars look amazing Ala! I love the coconut oil in here and sweet and salty is my favorite! I would definitely have a hard time not finishing the whole ban, they sound delicious! Omigosh, I just added this to the Etsy granola section because folks loved them so much. I can’t even begin to describe that sweet/salty/coconutty flavor. Love ya, Kelly!! 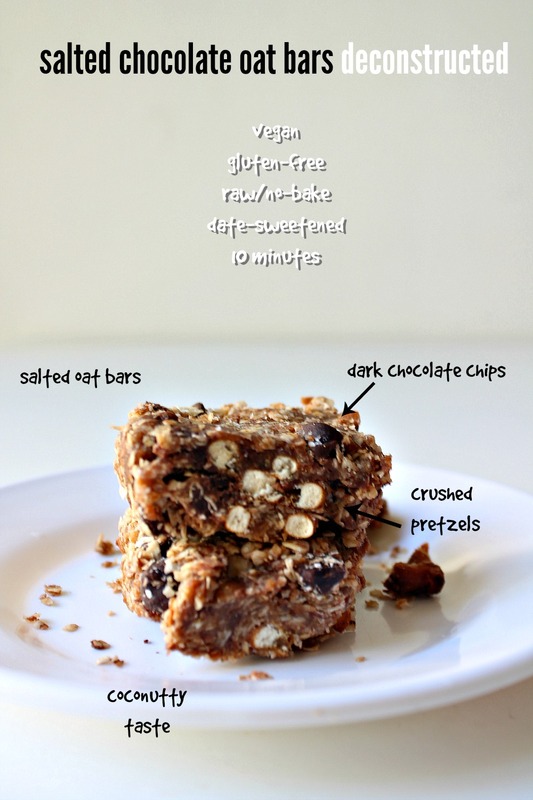 I am addicted to crunchy pretzels in my bars! Great call. I need to pull out these ingredients, asap! AbsoLUTEly, Amber! I just jumped on board the pretzels-in-things bandwagon not long ago and I am never looking back. Cheers!! if I want to make and give as party take aways will they last in plastic wrapping or must they stay in the fridge? Hi Stacie! 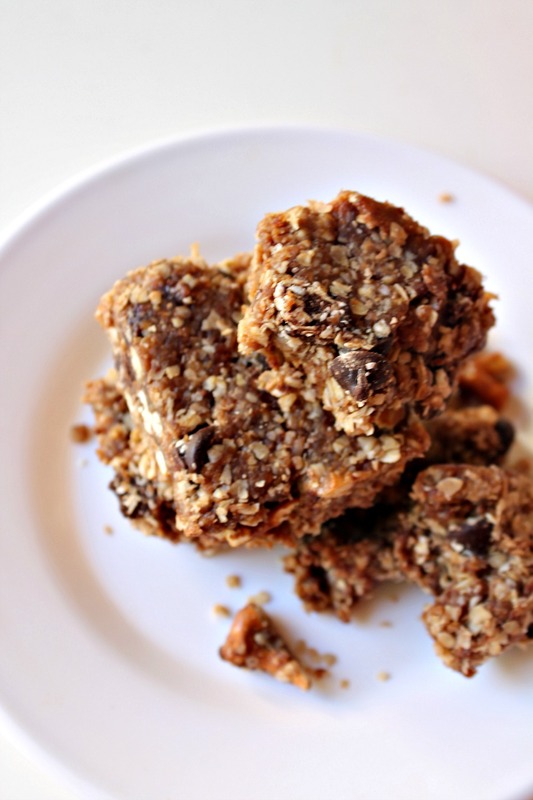 These are very crumbly bars, so chances are they may not hold up very well in room-temp plastic. 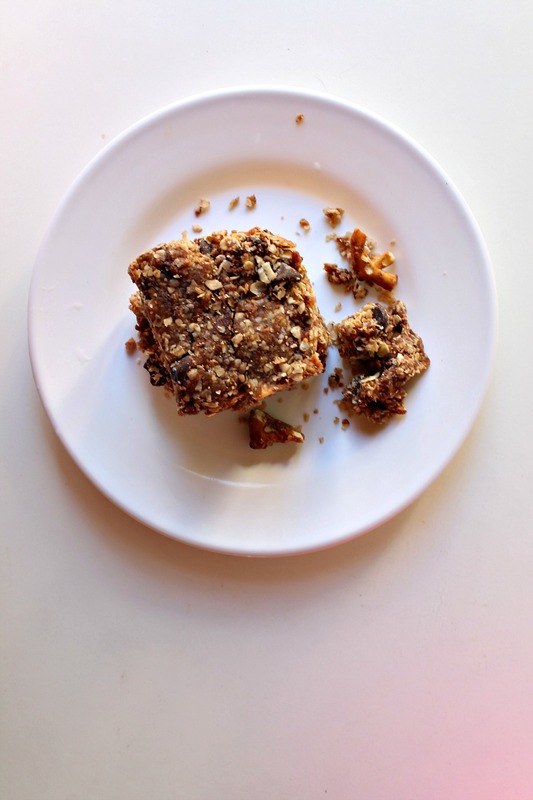 However, if you’d like to give them as party takeaways, my taste-testers LOVED eating it as an oat crumble, with large chunks to take home and sprinkle over yogurt or to enjoy with soy milk–so I’d still totally recommend them for handing out. Hope you give it a go and definitely let me know how it goes if you do! Hi Stacie, quick update: I just made these again for myself (huzzah) and they work perfectly fine cut into bars at room temperature, so you should have no problem packaging them in wrap. (Last time, I was out in 101 degree F weather, so no wonder they were crumbling!) Cheers! Oh these look absolutely amazing! Definitely on my list to make. I didn’t realize there are gluten free pretzels, but I guess they are making soo many things g-free now. I’m just afraid I won’t be able to stop eating them! Yes, Snyder’s definitely sell them gf now! But seriously, soooo good–can’t stop won’t stop, Linda! Cheers! I always need healthy bars for me or my on-the-go girls. These are PERFECT! YUM! This seems so perfect for breakfast. Can’t wait to make it. Thanks for sharing the recipe! Oh, I hope you love it as much as we all did over here! Let me know how it goes if you do–and cheers!